My fixation for Korean movies has a reason. To me, it just seems that they are much better in making movies than the western world. While most of the asian stock of movies that actually reach the US are either marketed as Kung Fu or Extreme Cinema, they neglect the really great stuff that Asia has to offer. Welcome To Dongmakgol! A small village in the mountains in between the city of Pyongyang in the north and the pressing forces of the Democratic South and their American Allies. Nobody really knows about it except the few hundred who live there, and of course there's village idiot, Yeo-il (OldBoy's Kang Hye Jeong). One day a plane crashes into the mountains, which bears an American UN trooper(Steve Tashcler). After a few days, two 'lost' South Korean troops Pyo (Sympathy For Mr.Vengeance's Ha-kyun Shin) and Moon are led into town. 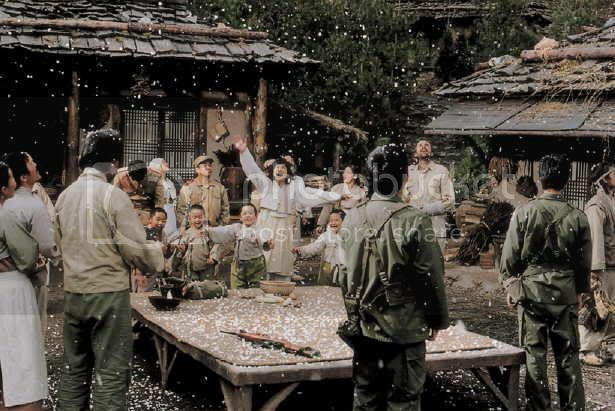 Later yet, the remaining men of a platoon for the red army led by High Comrade Lee (JSA's Jae-yeong Jeong) run into the troops as they pass through a village resulting an a hilarious standoff where neither party...well... don't know exactly what to do. The troops are caught in quite a pickle until one of them accidentally drops a grenade and blows up the village's food stock for the year. 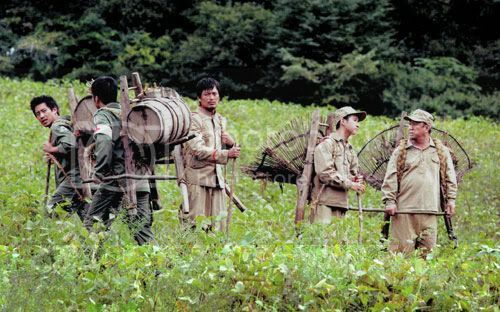 The troops of both parties then agree to replenish the destroyed stock by helping the villagers re-harvest their food...entirely abandoning the war and their political affiliations. The troops and the villages grow close from a series of encounters and happy mistakes that lead people to miss each other when they eventually leave. And as all this is happening, the Allieds press to search for the missing joe's plane, who unbeknownst to them, is partying with the Dongmakgoleans. they asume that his location was hostile territory an prepare to launch a full on assault. A beautiful movie worth watching again and again. What really got to me is the nostalgia provided by the sprawling scenery of Dongmakgol which is reminiscent of Hayao Miyazaki's Princess Mononoke and Howl's Moving Castle. And the music (apparently from the same guy who does Miyazaki's movies), my goodness, is the music great! I could go into detail about how great this movie is, but I'll just leave it to you. But all i can say is, If you have P70 bucks to spare, and you're planning on getting the clear-copy version of Brokeback Mountain, do yourself a favor and go get this one instead. last year's biggest moneymaker in the korean BO. 2004's was Taegukgi (? )..wonder which one's for 2003? after seeing Dongmakgol, told myself i wouldnt be surprised if it makes it to the best foreign film nominees this awards season. it did not, but it is still a great watch.. u know where else the "crazy" actress starred in? I think Silmido was the big moneymaker in 2003. Yeah, they figured it would be good Oscar material because it has a lot of Hollywood appeal (compared to the equally great but alienating Sympathy for Lady Vengeance. Aside from OldBoy,Kang Hye Jong was in "Rules of Dating" and the upcoming "Lizard" with her real life boyfriend as leading man. She also had a bit part in 'Sympathy..' as the newscaster in the first part of the film. thanks! i got the juice. you are right. so its Silmido for 2003 and Taegukgi for 2004. And now The King and I for 2005 since it was released Dec 29. Can't wait for the dvd copy of this most profitable Korean film! Thanks for your comments. Its nive to know that ther are people out there interested in Korean Cinema. They make some of the best movies around, IMO. love em korean films. THE KING AND THE CLOWN is the correct english title..just correcting meself! I cant wait for the King and the Clown to come out....I wonder what made it so popular...was it that androgynous woman-dude guy??? Yes, thats what I gather from the newsbits. It is poiused to be the largest in Korea's history. Benicio as Che Pics Online! Johhny Depp as the Joker?